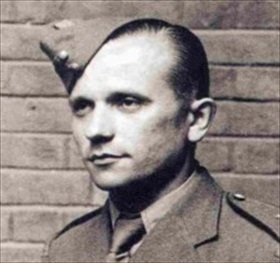 On this date in 1942, with the full leadership of the Third Reich in atten­dance, Nazi “martyr” Rein­hard Hey­drich was eulo­gized in one of the most elab­o­rate fune­rals ever staged in Ber­lin. (Hey­drich had been added by Adolf Hitler to the “honor­ary list of the Fallen of the Nazi Move­ment.”) The cere­mony in Hitler’s New Reich Chan­cel­lery was stage-managed and filmed by Joseph Goeb­bels, Nazi Min­is­ter of Pro­pa­ganda. 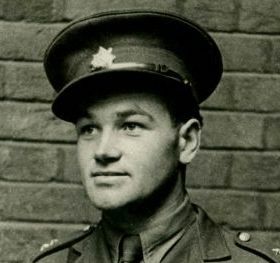 Two weeks earlier, in a British-inspired assas­si­nation plot code­named Opera­tion Anthro­poid, two Czech resis­tance fighters, Jozef Gabčík and Jan Kubiš, had suc­ceeded in mor­tally wounding the 38‑year-old Acting Reichs­protek­tor (Pro­tector) of Bohe­mia and Mora­via, today an area lying within the Czech Republic. Meanwhile, the SS (Schutzstaffel, the Nazi Party’s so-called “protection squad”) and the Gestapo (Geheime Staatspolizei, or Secret State Police) hunted down and mur­dered Czech resis­tance mem­bers and any­one sus­pected of being in­volved in or approving of Hey­drich’s death, nearly wiping out the Czech under­ground. In addition, 3,000 Jews were de­ported from the Czech ghetto at There­sien­stadt (present-day Terezín) and sent to their deaths. In Berlin, 500 Jews were arrested, with 152 exe­cuted as a repri­sal on the day Hey­drich died, June 4. 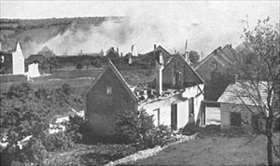 As for Lidice, it was com­pletely leveled, its grave­yard disin­terred, and grain scattered over the spot where the vil­lage had stood. Even the name Lidice (German: Liditz) was removed from German maps. Left: Jan Kubiš (1913–1942), one of nine Czecho­slovak British-trained para­troopers dropped into Czecho­slo­va­kia as part of Opera­tion Anthro­poid, the daring and suc­cess­ful assas­si­na­tion of SS-Ober­gruppen­fuehrer Rein­hard Hey­drich (1904–1942), Reich Pro­tector of Bohemia and Moravia. Right: Jozef Gabčík (1912–1942) was a Slovak soldier in Czecho­slo­va­kia’s army-in-exile in Eng­land. Using an anti­tank grenade, Kubiš and Gabčík way­laid Hey­drich on May 27, 1942, as he com­muted in his open-topped Mer­cedes-Benz between his home and office in Prague Castle. 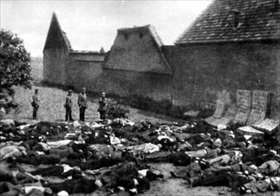 Left: Men massacred in Lidice village, June 10, 1942. Taken by a German soldier, this photo­graph was ini­tially kept by the Gestapo. Hours earlier all male vil­lagers were rounded up and taken to a farm on the edge of the vil­lage that belonged to the Horák family, whose son Josef served in the Czecho­slo­vak army-in-exile in Britain. Mat­tresses were taken from neigh­boring houses and placed against the Horák barn. 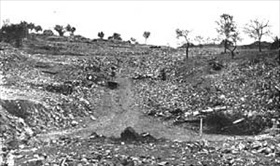 There 192 Lidice citi­zens were exe­cuted, ten at a time, in cold blood. The mas­sacre came to sym­bo­lize Ger­man occupation of Czechoslovakia. Right: The Lidice tragedy was filmed by those who actually carried out the bru­tal crime. Ger­man author­ities glee­fully reported Lidice’s de­struc­tion in news­reels and propa­ganda speeches. 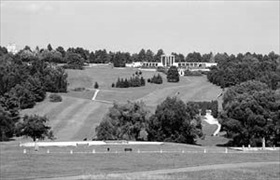 To the Allies, Lidice became the sym­bol of the Ger­man policy of Schreck­lich­keit (terror). The film was entered into evi­dence at the Nurem­berg trials of Nazi German leaders in 1945–1946. Left: Having rid the village of its inhabi­tants, the Nazis de­stroyed the vil­lage it­self, first setting the houses on fire and then razing them to the ground with plas­tic ex­plo­sives. They didn’t just stop there but pro­ceeded to de­stroy the vil­lage church and ceme­tery. In 1943 all that remained of Lidice was an empty space cor­doned off by signs forbidding entry. Right: Instead of consigning Lidice to eter­nal obli­vion, Lidice came to sym­bolize the Ger­man occu­pa­tion of Czecho­slo­va­kia. In the U.S., Mexico, Panama, Peru, and Brazil towns adopted the name Lidice in memory of the village, and many women born at that time were named Lidice. Over­looking the site of the old vil­lage of Lidice today is a museum and a small exhi­bition hall, and in front of the museum is a bronze memo­rial to the chil­dren killed in the Chełmno death camp in Poland. After the war ended, only 153 women and 17 children returned to Lidice.